Republican senators who blocked the confirmation of an African-American congressman to lead a key federal agency should brace themselves for a major fight with Democrats and numerous minority agencies that support President Barack Obama’s nominee. 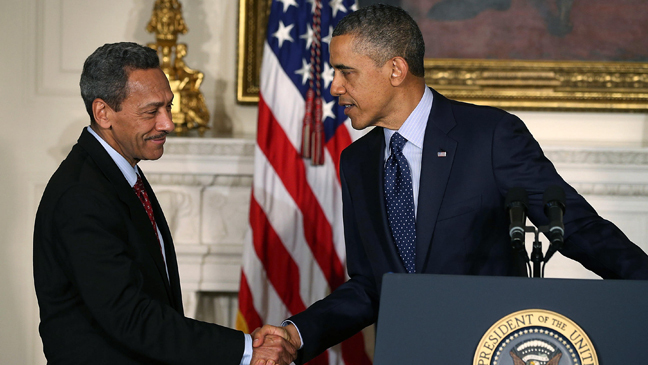 The Congressional Black Caucus (CBC) has joined others in the Democratic Party as well as a number of black and minority leaders in denouncing the Senate in its vote against the appointment of Rep. Mel Watt (D-N.C.) to the post of director of the Federal Housing Finance Agency. “The conversation on rules changes can’t come fast enough for me,” said Sen. Chris Murphy (D-Conn.). “The failure to confirm Watt is a government shutdown by another tactic,” said Murphy, 40. While Murphy and others have sought to change the rules on confirmations, senior Democrats said they were hesitant to do so out of fear they would regret it when Republicans gain control of the Senate. The Senate voted 56-42, on Oct. 31, to end the blockade against Watt, falling four votes shy of the 60 needed to prevail and secure confirmation. “What happened has only occurred once in the history of this Congress,” said CBC Chair Marcia Fudge. “This is a disgrace to this body and a disservice to the American people,” said Fudge, 60. Prior to the Senate vote, several political and civic groups voiced concern that the GOP would not give Watt a fair shake. Many said the congressman had already proven that he deserved confirmation. “If Watt is not confirmed, it would set a disturbing new precedent for our nation,” Wade Henderson, head of the Leadership Conference on Civil and Human Rights, located in Northwest Washington, D.C., said one day prior to the vote, on Oct. 30. “No sitting member of Congress has been successfully filibustered since the Civil War,” said Henderson, 65, during a conference call, which included officials from the National Association for the Advancement of Colored People (NAACP), the League of United Latin American Citizens (LULAC), and the National Urban League. The CBC organized the call in which participants answered questions from various national media outlets. Watt, 68, has served for 20 years as a congressman from North Carolina. Republicans claimed that Watt lacked the expertise for the job that includes overseeing Fannie Mae and Freddie Mac; the government sponsored housing corporations, which control the vast majority of the U.S. mortgage market. Supporters maintain that Watt is not only qualified, but has a history of promoting legislation that would have averted the recent housing crisis. “It is virtually unprecedented for a sitting member of Congress to be rejected by the U.S. Senate,” said Rep. Maxine Waters (D-Calif.), a ranking Democrat on the House Financial Services Committee. “I urge his immediate confirmation,” said Waters, 75. Rep. Caleb Cushing (D-Mass. ), who served in Congress from 1835 to 1843, had his bid blocked by the Senate when President John Tyler nominated him to become Treasury secretary. It’s the last time the Senate blocked a nomination of a sitting member of Congress. Born in Mecklenburg County, N.C., Watt graduated from the University of North Carolina in 1967 with a degree in business administration.